Product prices and availability are accurate as of 2019-04-19 01:50:30 UTC and are subject to change. Any price and availability information displayed on http://www.amazon.com/ at the time of purchase will apply to the purchase of this product. 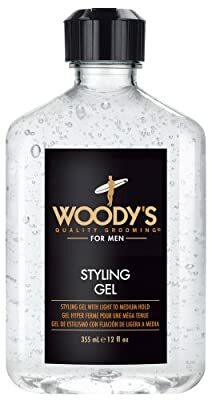 Woody's Styling Gel is a gel with light to medium hold. The perfect styling tool for every day or whenever. Its light hold makes it the perfect blow dry gel or quick non-tacky styling gel to put unruly hair in place without stiffness. Creates a ton of volume; easy to use with never a flake or a drop of alcohol. Perfect for fine & medium texture hair.